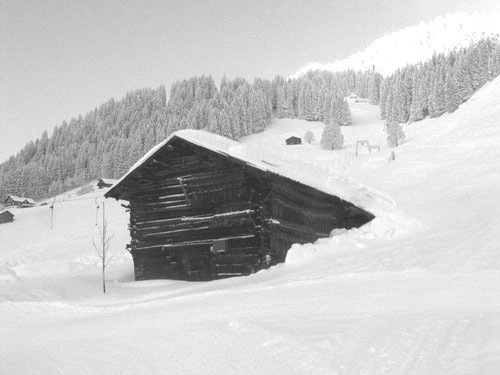 According to investigation the building of barns in Kleinwalsertal goes back as far as the 14th century. However, only one beam could be found where the tree had been cut down in 1389. When building a barn first of all six or seven layers of square axed beams were set on the foundation wall. The space for the door was planned whereas the lowest beam also acted as a threshold. Above the barn’s door there is the beam supporting the door (Türstützbalken) which normally spans the whole front of the building. The block construction is called “knitting” (stricken) and where the beams mitre is called the “head-knit” (Kopfstrick). The extraordinary support of these buildings goes back to the wooden tenons that hold together the beams. A high degree of isolation was reached by filling the empty spaces with moss and sealing the splices with wooden slabs and plaster. The cowshed (Chuazemmer) was covered with long floorboards that were made of chopped trees. When building the hayloft, round timber was rolled over slanted beams up to the required hight with the help of ropes. Seven or nine layers of beams were put on top of the cowshed. There was space was left for a double door on the back wall showing to the mountains. The roof was timbered from six stringers (Fürschta) and 24 rafters. There are two stringers put together underneath the ridge as a single stringe would only have allowed for a bad closing of the two halves of the roof. The roof was then shingled. They were weighed down and secured with poles and stone chippings. Today, this type of roof has often been replaced by unsightly tin roofs.